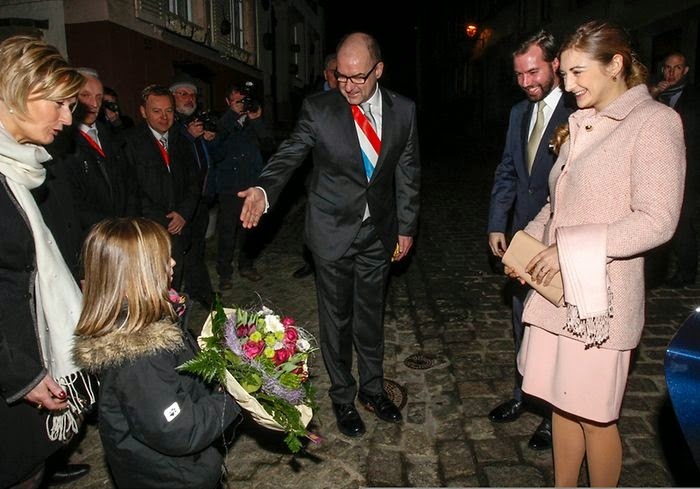 Last night, Hereditary Grand Duke Guillaume and Hereditary Grand Duchess Stéphanie visited Vianden to mark the 70th anniversary of the city's liberation in World War II. The Hereditary Grand Ducal Couple first attended a mass at the local Église des Trinitaires followed by the lightning of eleven candles for the American soldiers who died fighting for Vianden's freedom. The Hereditary Grand Duke and the Hereditary Grand Duchess also placed a wreath of flowers at the Second World War memorial in Place de la Résistance and visited a photography exhibition at the town hall showing the city's reconstruction after the war. More pictures of Thursday night at Wort in German and Wort in English.